Dice, Doubloons and Random Musings: A Time To Harvest Session 2: "The Darkest Part of the Woods"
A Time To Harvest Session 2: "The Darkest Part of the Woods"
We had the second session of the Call of Cthulhu organized play campaign "A Time To Harvest" this past week, and while it was a short session (I try not to run super long, due to one of my players having anxiety issues that makes it hard for them to spend long periods of time around strangers, plus I've been having wicked insomnia problems lately, meaning my energy levels aren't where I'd like them to be) I feel like a lot was accomplished. The players divided up and spread across the small town of Cobb's Corners, Vermont to gather information and then came back together to share what they'd learned, piecing together dissociated knowledge in true Cthulhu Investigator fashion. I'm not sure how we ended up with half the PCs having first names beginning with "R," but here we are. When we last left our heroes, Perry had just been handed a photograph, seeming to show something flying in front of the moon, by local newspaperman Richard Wendell. Wendell believed that it was to destroy this photograph that his darkroom was trashed by forces unknown. Perry asked Wendell to run off a few copies of the photograph, arguing that it would be best to go public with this - whoever tried to suppress the photo can't if there are copies circulating throughout the town. That night, another round of strange and confusing shared dreams struck the group, afflicting almost all the player characters. In the morning, on his way to the outhouse, Roni spotted a strange creature, a small humanoid shape about two feet tall with an oversized head, pinkish-gray skin and no facial features save a pair of glowing green-orange eyes. When he dropped his copy of the Sears Roebuck catalog at the sight of this thing, it glowered at him and took off running into the Sugar Maples behind the property. Robert Blaine, the expedition leader, sub-divided the folklore students for this day's work, putting the player characters in one group and the NPCs in another (to ease the GM's burden, haha). Darren was assigned to the "soil" group to assist the archaeologists and geologists, while Perry, a journalist, was left to his own devices. A place called "Broken Hill" was significant - some legends marked it as a Native American burial ground, others as a burial ground for massacred white settlers. Supposedly guarded by a huge, spectral hound that can be turned away by the sign of the Cross. The valley in which Cobb's Corners sits is largely devoid of insects and wildlife - "only man and what man brings with him dwells here." There is an unusual high death rate among children in Cobb's Corners. The entire graduating class of 1919 (five students, but still) were dead before the end of that summer. Agnes Bellweather, living alone past the edge of town, is a witch. Allegedly, when she caught her husband with another woman, she cursed his privates off and left him to kill himself. A visit to the town physician, Dr. Perry, confirmed that there's a high death rate among children. Dr. Perry voiced his opinion that, as fantastic and unbelievable as it may seem, he's come to the conclusion that a vampire is at work - the children are often found drained of blood, splashed with pig's blood to disguise the loss. He speculates that Sarah Maclearan, dead 20 years, is the vampire, as shortly after his arrival in town he got called on an unusual case: her grave had been vandalized, and he was asked to ensure that nothing untoward had been done to her body - only to discover that her casket contained a dead calf. The whereabouts of Sarah Maclearan's body remains a mystery to this day. A visit to Agnes Bellweather revealed her to be an elderly woman, barely 4 feet tall, blessed with an abundance of common sense and humor. She explained that she'd been the village midwife and apothecary until the sheriff forced her into retirement at Dr. Perry's arrival, though people still come to her for remedies for toothaches, infertility, and less medical maladies such as bad luck or feeling jinxed. Rip made friends with her cat Beltane. Meanwhile, the digging team turned up a single arrowhead (Darren's player Mike, being a wise guy, asked me if it was a Clovis point. Without missing a beat, I said, "No, Solutrean." He's not the only wise guy at the table) and otherwise labored fruitlessly in the sweltering heat and humidity. Darren did his best to try and catch the eye of the attractive young botanist Clarissa, but without much luck. Dark, heavy storm clouds were beginning to roll in and the PCs reconvened at the Maclearan farmhouse, sharing what they'd learned with each other over spaghetti. Noting that the dig site was nowhere near Broken Hill, they raised the possibility of digging near there to Blaine, who claimed that last summer, the team he'd been a part of had dug near there and turned up nothing of value, plus the terrain is treacherous and choked with thorn bushes. That night, Randall, laying awake in a puddle of sweat as the humidity built and built, heard the door to Blaine's room creak open. He sat up. "Where are you going, Blaine?" he asked suspiciously. Blaine jumps a little, and swings his flashlight around. "I just have to pee," he mutters, heading for the door. When Blaine doesn't return to the farmhouse after about fifteen minutes, Randall wakes his fellow investigators. "Blaine went out fifteen minutes ago. I wanna see where he went." Stepping outside, Oliver began calling Blaine's name, getting no response. Knocking on the door of the outhouse likewise got no response. Pulling open the door revealed it to be unoccupied - where had Blaine gone? We ended the session on that cliffhanger, leaving the players to kind of simmer on that mystery until our next session, which will be May 31st. 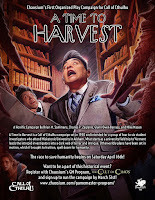 I do have some exciting news on the Call of Cthulhu front as well - because demand is so high right now at my local game store, I will be adding an extra game day to my schedule and running an open table event one Sunday a month for people who are interested in Call of Cthulhu but have perhaps never played before, and possibly working with the store owner to arrange an extra game master to begin running Cthulhu games as well. This is, to be blunt, amazing. Call of Cthulhu is a long-standing, much beloved game, but not one that seems to get a lot of love in game stores; Just Games Rochester is the only store in the area with Call of Cthulhu events on its calendar at all, and right now those are all full, so we're creating more to keep up with demand. Matt, the store owner, pointed out to me as well that I'm starting to become the public face of Cthulhu in Rochester - I'm the guy busting my hump to run great games, I'm the guy going out and talking up the game, I'm the guy people are getting referred to when they have questions about Cthulhu gaming. It's kind of surreal, but I'm willing to roll with it. I would like to get to the point where I'm helping to arrange more events not just through Rochester, but all of Western New York; there's a game store in Buffalo that I'd like to look at starting to run periodic games at as well to increase the visibility of Call of Cthulhu, with an eye towards bringing in other GMs (unfortunately, I can't run all the games) and getting big monthly Cthulhu events on the calendars of a couple stores. There's a Savage Worlds group here that I'm looking at as a model of how best to achieve this. 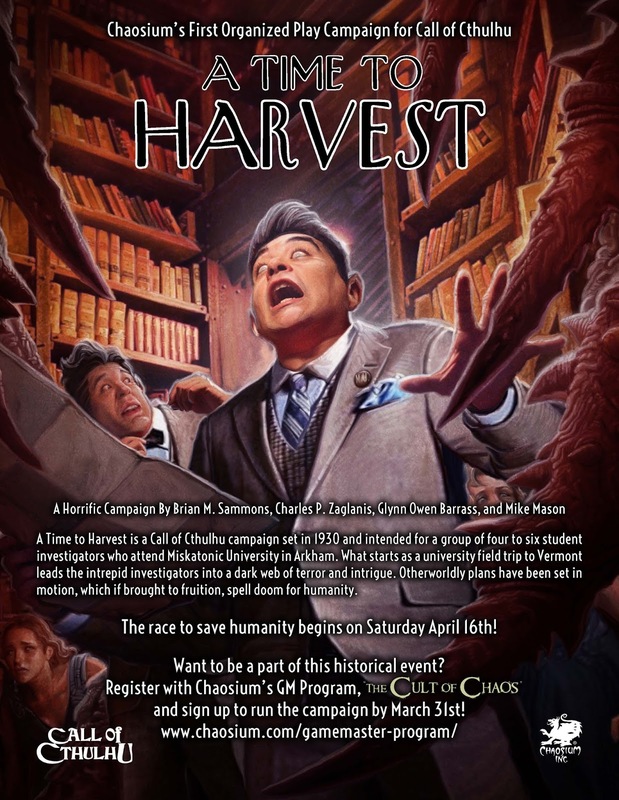 ADDITIONALLY, Matt asked me to help organize a release party to mark the arrival of the 7th edition Call of Cthulhu books in store, and I'm very excited for that. Todd Gardiner, Chaosium's director of organized play, was kind enough to provide me with a demo adventure, not yet ready for publication, to run at the release party, and we're going to have that running simultaneously at multiple tables throughout the store to maximize visibility and expose as many people as possible to the infectious madness that is Call of Cthulhu. I'm debating getting a black robe to wear in my role as master of ceremonies for this event, which will be June 5th starting at noon. So there is a ton of Cthulhu gaming going on in my life right now and in the weeks to come.